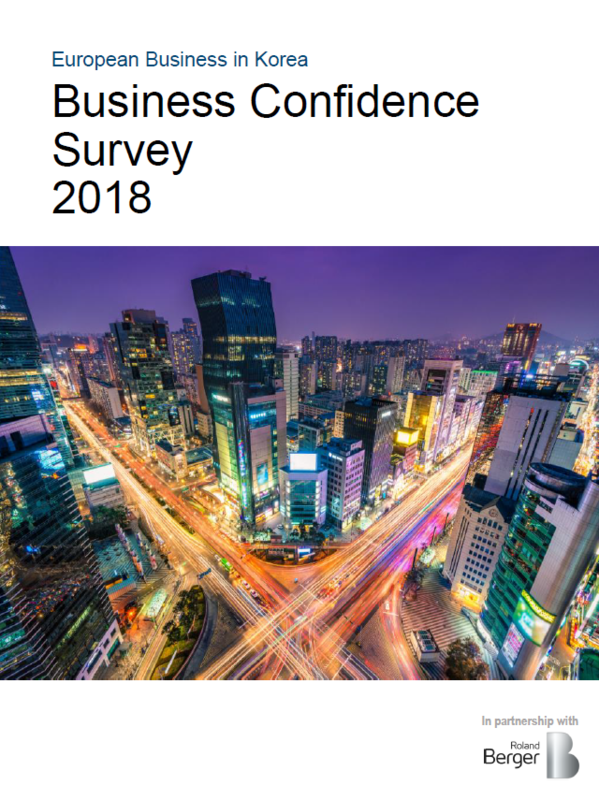 European national chambers and business councils in Korea released the results of Business Confidence Survey 2018 on March 8, 2019. European company executives, representing over 38,000 employees and a total turnover of EUR 36 billion (equivalent to KRW 47 trillion), participated in the survey. The company profile included various industries, diversely ranging from services to manufacturing to provide an unbiased viewpoint. Of the respondents, close to 70% have operated in Korea for more than a decade. Since 2014, the Business Confidence Survey has been conducted to take an annual snapshot of European companies’ perceptions towards the business environment in Korea. In partnership with Roland Berger Seoul, 12 European national chambers and business councils in Korea collectively organized the survey. The European chambers hope the survey serves as a useful tool for business people and policy makers to make future forward decisions for the mutual benefit of the Korean and European businesses. The results of the Business Confidence Survey 2018 can be found on websites of the participating European Chambers and business councils. Overall, European companies viewed Korea as an important market. More than half of the respondents have plans to expand their business operations in 2019 in Korea. About 84 percent have responded that ‘Korea is increasing in strategic importance’ or ‘Korea holds same level of importance to the company’s global strategy’. The majority of the total respondents said that they are either ‘very content’ or ‘content’ with the company’s performance in Korea. 73 percent of the respondents named Korea’s slowing down economic growth as significant. 60 percent cited ambiguous rules and regulations as significant. In order to increase performance, ‘fair competition’ was the most paramount, followed by ‘rule of law/transparent policy-making’.